The construction of this Bahá’í temple became possible because the staunch believers all over the world made their donations for it. The building works started on April 21st, 1980, and were finished on December 24th, 1986. In order to construct this magnificent temple, a talented Canadian architect, born in Iran, Fariburz Sahba was employed. The Lotus Temple is a preaching house for the Bahá’í adepts and at the same time one of the most vivid structures of the modern Delhi. 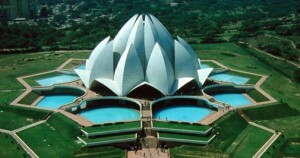 The temple building has the shape of a giant lotus flower, which consists of twenty seven petals, which are arranged into three rows. The lotus petals are made of white concrete, and outside they are covered with slabs of white Greek marble. It took two years only to make a computer model of the great temple. 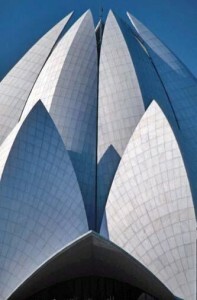 The Lotus Temple is unique due to the fact that it does not contain a single straight line. The entrance to the temple territory is free and anyone can step inside, no matter to which religion he or she belongs to. The building also possesses a unique ventilation system, which is based on the ventilation principles of ancient structures. The warm air from the central hall comes out through an opening in the dome, and the cool air enters the hall after coming through a system of water tanks and the foundation. In order to ascend to the temple, you have to take off your shoes. At the beginning of the stairs there is a special place where you can leave them absolutely for free, without being worried about their destiny. When you come back, your belongings will be returned to you, for sure. People who wish to visit this sacred place have to unite into small groups. They are formed right at the entrance. Inside the temple it is forbidden to talk, take photos and shoot video. It is very quiet and cool there. Beneath the dome the giant golden symbol of Bahá’í is situated. Right under it several rows of chairs are placed, where one can sit and dream: the only condition here is being quiet. Before the temple was constructed, the place that it occupies now was known as the mystical settlement Bahá’í Pur (translated from Hindu as “the house of Bahá’í”). At the exit from the territory of the Lotus Temple there is a small museum devoted to the process of its construction, with photos, miniatures and instruments that were used in the building works. This is a must to see this museum during your visit to the Temple, as it contains a lot of things that will catch your imagination. – The land plot for the construction was bought in 1953. – The Temple occupies the territory of about twenty six acres. 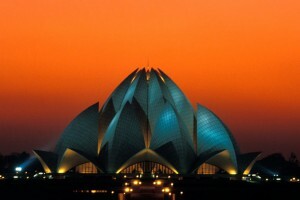 – The height of the Temple is a bit more than thirty four meters. – It has enough space for 1300 people. – The temple is surrounded by nine pools. – The diameter of the structure is seventy meters. At the end of our journey, it is worth telling about a prophecy about this unusual and impressive structure: “Four hundred and fifty years ago Shah Akbar, the greatest of the Mogul dynasty, dreamt about his own majestic palace and about uniting all the peoples of India under the single universal faith: “And I had a dream that stone by stone I erected a sacred temple. Not a pagoda, nor a mosque nor a church, but a more elevated and simple one, with gates open for the breath of Heaven, and the Truth, Peace, Love and Justice found a home in it”.